After going in and out stores in Seoul, I still havent found the perfect leather jacket. I've always wanted a Balenciaga jacket but ACNE jackets have a different feeling with Balenciaga (and its $600 lesser from Balen price tag LOL). Balenciaga is more... feminine while ACNE is more casual looking just effortlessly cool. And it's been 3 months now since I've been living in Seoul, now I rarely carry a big bag. I only bring my phone everywhere -which the cover has my debit, credit, bus/train, and identification cards. And in Seoul you dont really need to bring cash everywhere cus you just can TAP everywhere. So i usually just bring a very small bag to put my hand sanitizer, lipbalm, and powder. Carrying a big bag is very tiring, especially when you are out like one full day. And small bags are cuter! Eventhough with my height, me carrying a small bag is not very proportional. 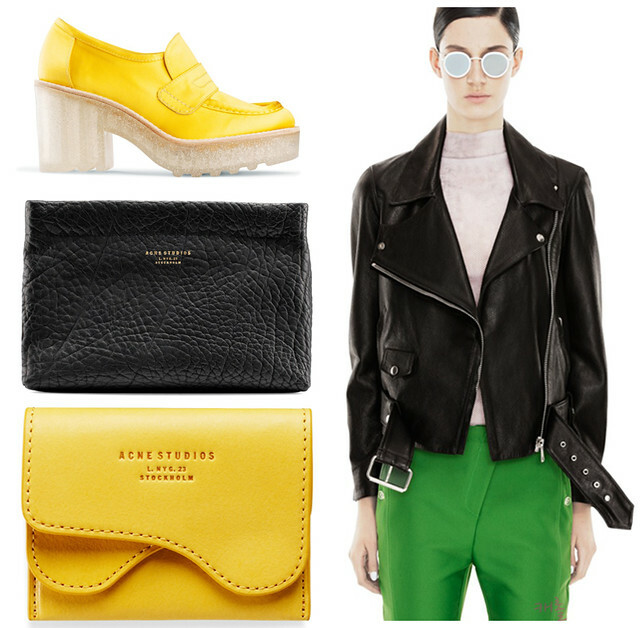 LOL Also... this yellow wallet just so cute, dont you think? Simple and the price tag is not bad either :D Also the black clutch.. I really like leather with textures - it makes it looks tougher? By the way... Spring is coming soon! Still very cold here (but not really cus I think I have adapted really well to the weather -but not the wind), but now you can see some flowers bloomed already.. This is my wishlist for Spring! Whats yours?